Then in 2010 the after South Africa, armed with a briefcase full of hundred dollar bills, were granted the rights to hold the football world cup, Zuma was re-infected with another strain of APG from a certain Septic Bladder. The combinations of these two strains seems to have created a mutant multi-drug resistant supervirus, the like of which hasn’t been seen before on this continent. I think the events of the last week perfectly demonstrate just how far we’ve slid since ’94, and the scary thing is, we could still slide further. I wasn’t going to write about this, until I saw the vile display by JZ in parliament taunting the opposition on the way they speak, the fact that they won’t let the Nkandla issue drop, and how Maimane obviously got to Zuma at the State of the nation. Clearly Zuma knows he’s outclassed in every way by Maimane, as he was by Mbeki, and seems to be reacting as a bully would to someone who intimidates him. 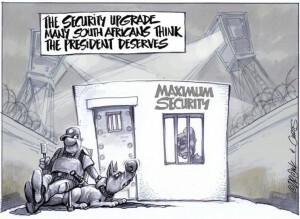 On to Nkandla. This grand showerhead of a selfish man decided he wanted a palace. Not a presidential palace of course, since he’d have to give that to the next president, he wanted his own. But palaces don’t come cheap, and number 1 hasn’t learnt the basic behaviour for prosperity, spend less than you earn, invest the difference and stay out of debt, meaning he has no cash. Seemingly even the Guptas pockets don’t go that deep, but not to worry, JZ has a whole country to loot, and since history has shown him we’re willing to standby and allow this, he’ll just carry on with his merry pillaging. Fortunately we still have one upstanding government body that king JZ hasn’t managed to sabotage just yet, run by, if you believe the ruling party, a CIA spy named Thuli Madonsela. Well Thuli said this is just not on, you can have your electric fence, guard houses and motion detection cameras, but a swimming pool, cattle kraal and chicken coup is for your own account. We won’t even get into the tuck shop, that would just be ridiculous. So Madam Thuli laid down the law and said that Zuma must pay back some of the money, leaving treasury and the police ministry to decide how much. Fast forward a year to today. Zuma has called in a fellow henchman by the name of Nathi Nhleko, who while he may be too young to be diagnosed with Selfish Old Man disease, is showing most of the symptoms, and would likely be found positive at a later date. Interestingly, our esteemed Minister of Police must be an exceptional person. Earning this great position in spite of leaving school in Standard 9, and never having studied any further. There is of course his “Masters Degree” from Leeds Metropolitan University, an institute so admirable that their website is now defunct, but from reading, they used to offer online degrees based on “life experience”. In the private sector this great man would struggle to find a job, let alone a R2.2 million rand ministers post. 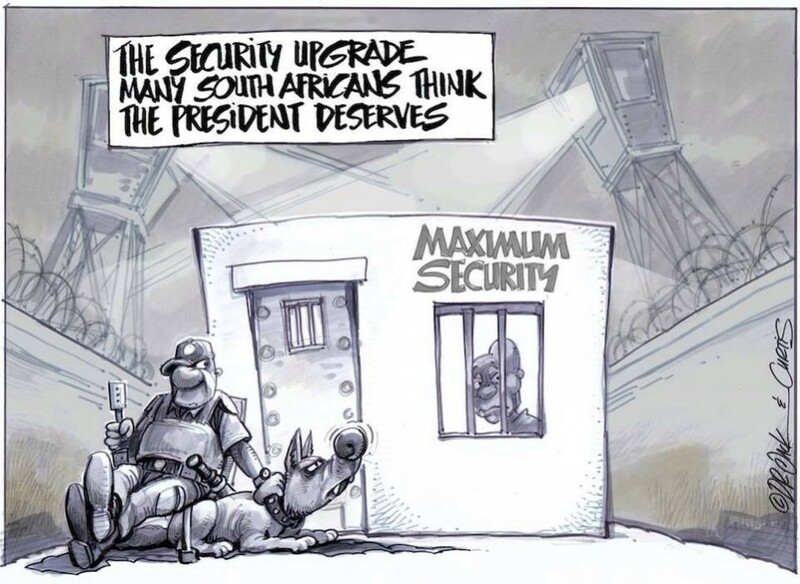 In light of this, he is obviously rather indebted to Zuma, and given the chance, would most likely have claimed that the presidential bed should stand on diamond encrusted paint tins to keep the tokoloshe at bay, the walls should be lined with gold to protect against radioactive moonbeams, and that the bathtubs should be filled with asses milk to ward off tsetse fly attacks. Instead though he used a different tactic. What great cinematography we were treated to, where we were shown just how rubbish the local fire department was. Arriving late and being unable to start the lawnmower engine on the back of their toyota bakkie (you really can’t make this stuff up!). Surely this was not good enough for lazy JZ. 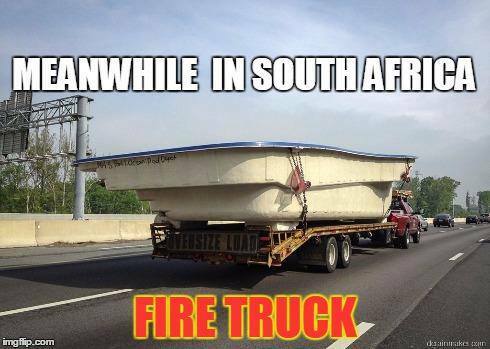 But instead of spending a few mil on a new fire engine to service the entire community around Nkandla, how about we use that money for a pool instead. Then we’ll show them the video of water being pumped out of a pool. This is ground breaking stuff this, queue the cheesy opera music! I wish I was embellishing here, but it all happened, in parliament! Similar comedy was shown when a chicken set off the motion sensors. Luckily they were caught, imagine if they got close to the president and tried to set up a nest in between the two humps on his head. Lastly there was a speech about how a cattle kraal was a spiritual place for a Zulu man. That’s all good of course, but how does that influence security? Are we worried that an ancestor would be upset that the cattle are free in a country where most of us lock ourselves up? Would he then send an army of lice to invade the presidential armpits? It’s all just so ridiculous that it’s not even worth speculating. Our governments priority is clear. Protect no 1 at all costs, screw anyone else, and the economy too. Common sense can take a back seat, and moral decency should stay in Europe as it has no place in this country. Thank god there is no two-thirds majority, otherwise you can bet your own fire pool that we’d see an attempt to throw out the two term presidential limit. And don’t dare say anything negative or you’d just be labeled a racist, or if you’re of the same race of the president and don’t seem to agree, then you’re just a “clever black”. The media better shut their faces too, as they never have nice things to say about Zuma, can’t for the life of me work out why. And that brings us to try and devise a solution to the problem. Clearly the number one selfish old man has to go. Unfortunately we can’t just sentence him to death like they do with former presidents in Egypt, though I’d love to see a court hand out a sentence of “Death by trying to catch your fat nephew Kulubuffoon Zuma like you used to do when he was a child”. Ideally, we’ll simply make our votes count, though living in a country where 16 million people are supported by the state, they’re unlikely to change the status quo. The problem doesn’t even lie there, the problem lies with the 4000 odd delegates at Manguang. After having observer Zuma for almost 5 years, they somehow saw it fit to elect him again for another 5 years. Having just 4000 people, almost all of them looking after their own interests picking a president for 50 million people just doesn’t sound like a democracy to me. And if that is a democracy, then democracy is failing us. What we need to do is act more like a corporation. In a corporation, when it comes to voting on issues, the voting isn’t done by the employees, it’s done by the shareholders. And as we are the shareholders of South Africa inc, have an opportunity to make a small yet visible difference next year when we do go to vote in the municipal elections. If we can make a significant dent in the voting results, as we did in Gauteng in 2014, then we could set about a chain of events, leaving the only people with the power to remove Zuma with no other choice. This happened to Mbeki, though sadly the people of South Africa we’re on the receiving end there, and it could happen again. We need to pretend we’re voting for a man and not a party. If the stats are correct, then it’s quite likely the first election we’ll have in South Africa, where the outcome won’t be known until the results are added up. The Selfish Old Men might for the first time be put aside by the younger, smarter, and generally more honourable in South African politics. Bring on 2016.